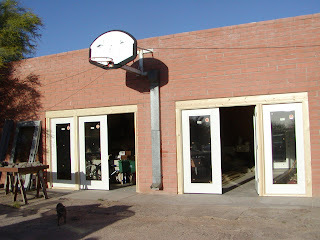 The garage will be finished by Friday. It sure cuts down on the wind and will be kind of warm without an air conditioner. I can then expand my workshop area to accommodate more people. I plan to do felting in there. It has already gotten too hot to do it outside in the sun. The doors and trim will be painted to match the rest of the house, but I was excited to see the doors up. They are going to put the studio and shop doors up tomorrow, or the next day. It will make a big difference in the shop, because there will be a lot more light, so the yarns will show better. Of course, I will have to keep my clutter down, since it will all be on view!